Spaces are limited to maximum of 12 riders. Register by April 30 and receive the MABDR DVD and map at no additional cost. Final deadline to register is May 15. Sign up for an all-inclusive and fully supported 5-day tour of the Mid-Atlantic BackCountry Discovery Route (MABDR), led by Jack O’connor who was a member of the expedition team that created the MABDR! Every detail of this trip has been pre-planned down to the smallest details! All riders will receive a complete checklist of what is needed and how to prepare. Jack will be your personal adventure concierge, available to answer all of your questions so that all you need to do is show up, ready for fun! 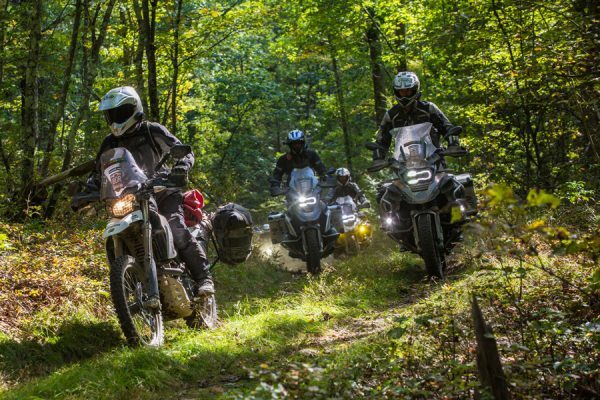 The MABDR is a scenic ride for dual sport and adventure motorcycles that uses dirt, gravel, and paved roads, that wind through remote parts of Virginia, West Virginia, Maryland, and Pennsylvania. This fully supported ride includes a pre-planned itinerary, downloadable GPS route, ride leader, sweep rider, and support truck that will travel parallel and can carry your non-essential gear to lighten your load! The support truck will be loaded with the tools needed for any mechanical failures or mishaps along the way. All meals on the road, at campsites, and hotels are included; as is all lodging including hotel and campsites. We will have your tent set up and waiting for you upon arrival! NOTE: Interested but do not meet the requirements? Check out Pine Barren’s Dirt 101 Class scheduled May 3 -5 in McAleveys Fort, PA. Click here for details. Upon sign up, you will receive a confirmation email including further ride information, instructions, along with a questionnaire to complete. Cancellation Policy: Bob’s BMW reserves the right to cancel or reschedule the ride if the minimum number of riders (6) is not met. In the event the ride is cancelled, riders will receive a full refund. Rider cancellation and request for refund before May 31 is a $500 fee unless we can fill your space. No refunds will be issued after June 1, unless we can fill your space. There will be no refunds issued for riders that are unable to complete the group ride. This is a rain or shine event.